About to have a go at painting the calipers on my silver bugeye WRX. Firstly, anyone know if Halfords own caliper paint is any good or should I just stick to Hammerite (or anything else)? Secondly, I've now removed my blue mudflaps and am replacing them with black ones. So, I'm now torn between black or red calipers - objective opinions welcome. 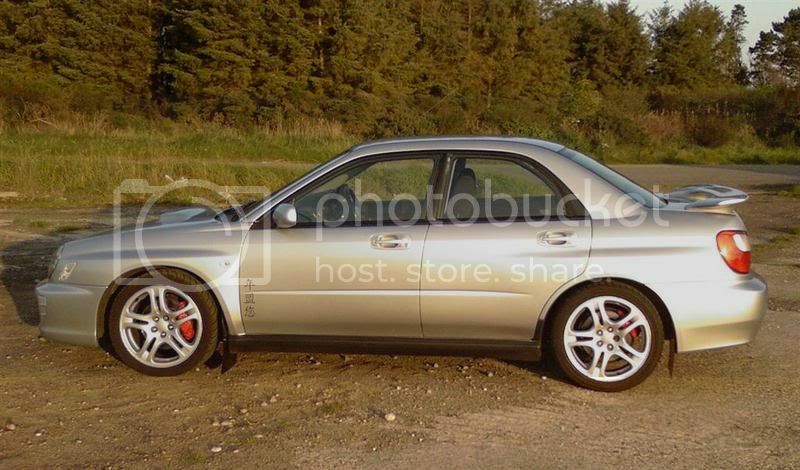 Impreza STi - The car behind is yours! Cheers Mal for offering an opinion. As mentioned I had blue rally mud flaps on but got so many side ways looks and less than positive comments about the silver/blue combination I was finally swayed by the dark side and took them off. There's no going back either, sold them to a mate with a blue STi. Anyway must have missed the issue of Max Powa which poured scorn over that colour coding. So, with no arguement from Lawrence Llewelyn-Bowen and his mates for black, it looks like red it is. Never used Halfords own brand paint but Hammerite smooth is very good. Bought some caliper stuff meself and thought it were crap used hammerite(smooth) in the end on calipers and rear disc centres where they rust like fcuk-cant fault it just used black meself coz ive got enough on with the rest of me polishing without calipers aswell lol. I need to get mine done, or even just cleaned but its just a case of finding the time to clean then and then paint them... Also, where would I find the Brembo stickers too? Finally got it done! The photo shows the car with the painted calipers and the new Pi springs that lowered it 30mm - just a pity about the low sun. Last edited by Scooby Doom; 23 Oct 2006 at 08:44 PM. How's the new springs? Better handling no doubt? Have you just replaced the shocks or just the springs or both? Sorry mate, I'm kinda blind! I had the rear shocks replaced as they were completely gone. I bought what I thoughtt were Jamex springs off good ole eBay for jusy under £70 but was sent a set of Pi springs instead which are normally about £115+ I always thought it sat too high so having it down even 30mm makes all the difference. I only got the 2nd cat taken out as I don't want to mess with the downpipe at this stage. Looking to get a Ninja centre and backbox in the new year. Once that's done I'm gonna start on the looks.